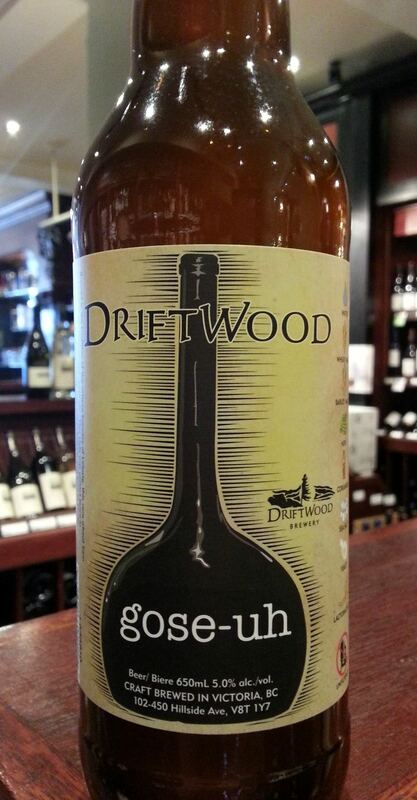 Back again with another limited release from the Driftwood Brewery. And this time around, its the late summer seasonal known as the Driftwood Gose-uh. According to the commercial description, Gose (pronounced gose-uh) is a rare type of German beer that originated in Leipzig. Using both wheat and barely malt, sea salt, coriander spice and the same type of yeast strain that gives sours their tart taste, this beer has apparently gone extinct twice, but is once again being brought back by artisan brewers who want to revitalize it. And after sampling it, I could certainly see why efforts are underway to restore it. Much like a good Belgian Wit, the Gose is light in color, cloudy in appearance, and has a gentle malt profile and a some nice spicey notes due to the addition of coriander spice. But the Gose manages to augment all that with a little saltiness and a smooth, clean finish that has just a hint of sour flavor. All in all, it’s basically a nice light ale with some added complexity that is well paired with spicey food, or just on its own as a way to beat the soon-to-gone summer heat. Personally, I hope the style catches on again and remains popular amongst the artisan brewing community and beer drinkers alike. I don’t imagine I need to tell anyone that a beer going extinct diminishes us all! What’s next for the Driftwood Brewery and its seasonal/limited-release lineup? Well, multiple visits to the brewery to get my growlers filled has yielded some insight there. Though there are no plans as of yet to release another in the Bird of Prey series, the brewery does have an anniversary coming up and promises to greet it with a specialty beer of some kind. I’ll let you know more as I hear about it! Hi all and welcome to another installment from Moon Under Water! Lately, the product lineup has been expanding, and I was sure to do my best to get in on the ground floor. Not long ago, I managed to snag a bottle of one of their first limited releases – their Brewvic Maibock – and was quite pleased. But this latest addition is permanent addition with year-round availability. So I felt that impressions counted doubly here. 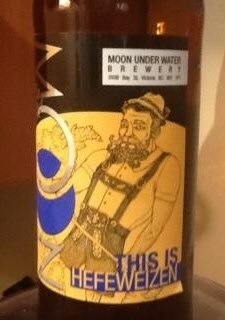 Though this is not the first wheat beer to be introduced to the brewery’s product line – i.e. the appropriately named Victorious Weizenbock – this wheat is purer example of the brewing tradition. I’m guessing that with all their success thus far, the brewers felt they needed to add a straight-up German wheat, with no crossovers or merging of styles to speak of. And the end product is certainly consistent with that, a very good, clean tasting hefeweizen that weighs in at an even 5.5% alc/vol. However, it manages to retain some spicy characteristics which are reminiscent of a Belgian Wit as well, mainly in the notes of clove and coriander, and rounds it out with a hint of vanilla. Overall, I was quite impressed with this beer and will definitely seek it in the future. Though there has been no shortage of limited-release hefeweizens and wits available of late, this one stands out for me as being one of the more drinkable and subtle. Delightfully colored, smooth, clean, refreshing, and with a subtle but discernible spice palate, it is an all around winner and perfect for these last few weeks of summer! On one of my recent trips up island, I had the chance to stop in at the town of Duncan, my wife’s old hometown, and do some shopping. As usual, the Blackberry Liquor Store was one of the stops on our tour, and I managed to find some new and interesting beers to bring home with me. 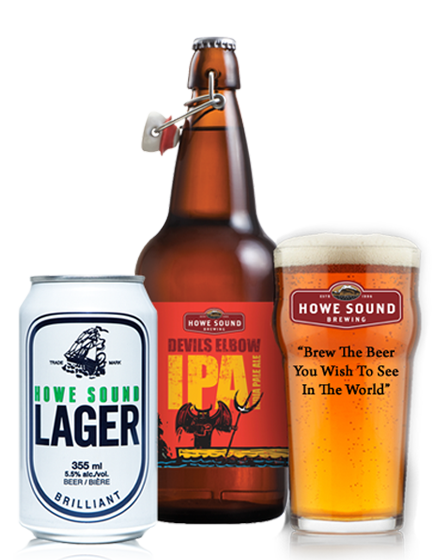 This time around, all three happened to be new releases (new to me at least) from Howe Sound Brewery. These include their Bay Ale, Loose Cannon Dark Lager, and You’re My Boy Blue. For awhile now, I feel like I’ve been neglecting this BC brewery, one which has been a favorite of mine for years. As I’m sure I’ve explained before, it was at Howe Sound that Frank Appleton, who went on to become brewmaster at Swan’s brewpub, got his start. And it was here that Sean Hoyne himself got his start, apprenticing under Appleton before going forth to establish the Canoe Club and Hoyne Brewing. So this brewery is not only a great purveyor of beer, its also part of proud genealogy that embraces some of my favorite breweries and brewpubs here on the island. The commercial description lists this beer as a “lightly-hopped, medium bodies lager”. But in many ways, this lager is akin to a stout, with a very dark profile and some serious traces of roasted malt, smoke and bitter chocolate. At the same time, it manages to finish quite clean and has a relatively mild, light flavor overall. All of this comes down to the combination of dark crystal and chocolate malts with German and Polish hops. Clearly, the name was chosen with this interest mix of characters and profiles in mind! And in a market where dark lagers are pretty well represented, its not a bad contender. Hoping to see more like it from Howe Sound soon. 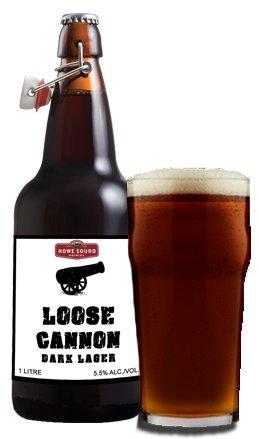 Apparently, this beer harkens back to when John Mitchell first opened Howe Sound pub back in 82 and was looking to create a true English-style amber ale. 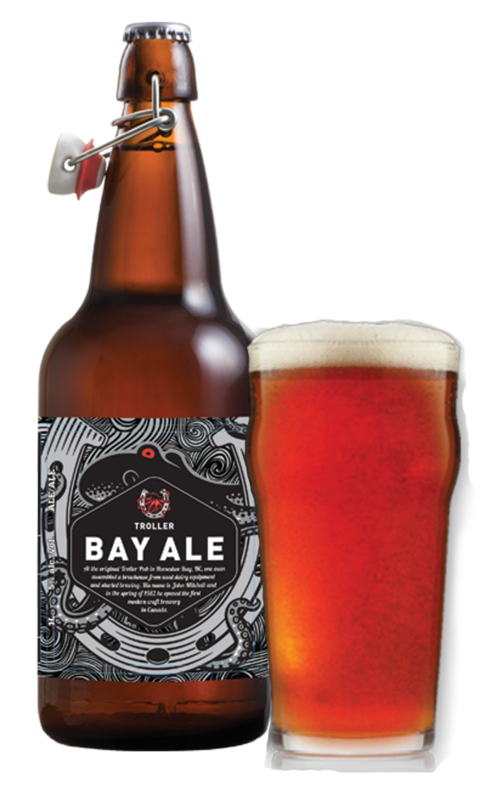 And this beer certainly fits that profile, combining smooth, toffee-like malts, mild hops, and subtlety, but with undeniable BC character. This is made possible thanks to the combination of Fuggles and Nugget hops and London ale yeast with Canadian barley malt and West Coast water. And according to legend, the brewery promptly sold out of the ale soon after it was released. But given its smooth, drinkable nature, that really shouldn’t come as a surprise. Now this was a surprising addition! Ordinarily, one tends to find raspberries, cherries, or even apricots wherever fruit is married to wheat ales. But blueberries? That’s a new one as far as I can tell! 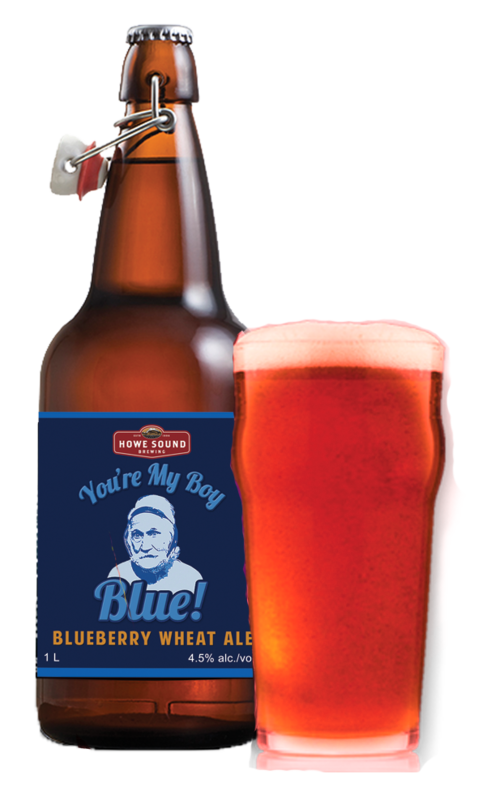 But in the end, the marriage worked quite well, with smooth, yeasty wheat malt flavors complimented by the slightly tart, slightly sweet character of fresh blueberries. And much like most fruit-infused wheat ales, this beer is cloudy, unfiltered, and has a slightly pink tint to it. And given the unseasonably hot weather we’ve been enduring here this summer, its a welcome addition to any beer drinkers sampling lineup. Guess which brewery’s products just made it into my neck of the woods? 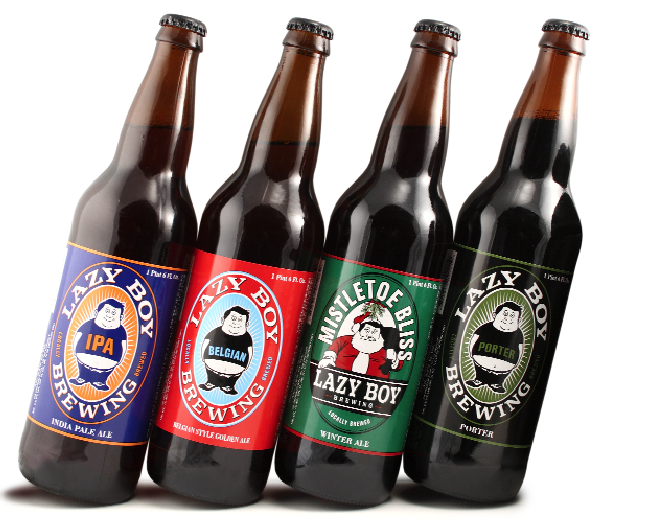 Well, as the title line would suggest, that would be Lazy Boy Brewing from Everett, Washington. Yes, the same state that brought us the Pike, Pyramid, Elysian Fields, and Odin breweries seems to have sent yet another of its craft brewers north of the border. And looking for something new, I decided to get my hands on a sample. And since the choice was between this and their IPA, and the fact that I was in the mood for something lighter and more conducive to hot weather, I grabbed a bottle of their Belgian Golden. And I have to say that I was very pleasantly surprised. Given the description and strength (8.7% alc/vol), I expected a lightly colored ale with syrupy, strong malts with that distinctive nose and aftertaste that comes from Belgian yeast. What I got was in fact a strong, sour ale, reminiscent of a Flanders Red thanks to the addition of that specialized yeast that brings out a beer’s lactic acid. And while not as potently sour as some of the Flanders I have come to know and love (the many beers that make up Driftwood’s Bird of Prey series), that does not diminish the overall impact it had on my taste buds. In fact, in many ways, it led to all-around more pleasurable drinking experience, since the lighter taste was more conducive to hot weather drinking. Yes, sour, tart, but ultimately clean and refreshing, this beer was an all-around pleasure! Yes, a most interesting combination; a sour golden ale. But I think it’s fair to say this beer just became a current favorite of mine. Here’s hoping the rest of the brewery’s lineup, which includes the usual suspects plus a few very interesting customers – a Christmas Brown and another Strong Belgian – is just as good. And here’s hoping it will be available in my neck of the woods too! As promised, I’m back with one of Victoria’s most important and summer limited releases. 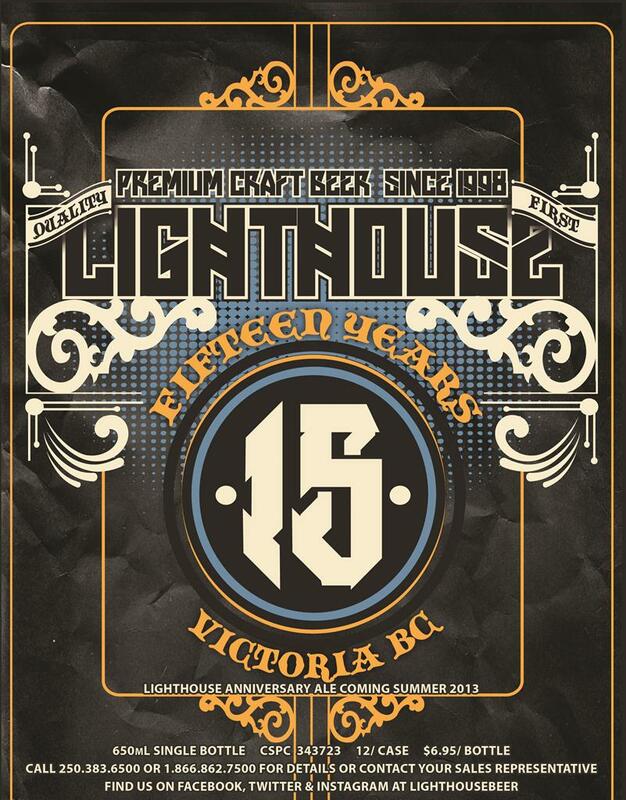 It seems that this year marks the Lighthouse Brewing Company’s 15th anniversary. And to celebrate, they have produced an anniversary ale which was clearly made with the brewery’s history in mind. I say this because over the years, the brewery has shown quite the range when it comes to producing different styles of beer. This has included the standard lineup, consisting of your typical British and American-style ales, but has also extended to include continental and time-honored varieties that are sightly more esoteric. And it seems that all of these have gone into the creation of this ale, which interestingly enough, names no specific variety on the label. And you’ll understand why as soon as you taste it. It’s dark and possesses some of the toasted, subtle tones of a brown, but is packed with some discernable sugars and is potently strong. And then there’s the hops and yeast, distinctly British in origin, and the Maibock like tang and sweetness that lingering on the palate. It is a brown? It is a barely wine? Is it a bock? Is it a bitter? Well… yes, and no, and all the above. Not a bad way to mark 15 years of brewing: produce a beer that cuts across styles and traditions and offers some very varied taste. And of course, Lighthouse is no stranger to this trend, as exemplified by their Big Flavor series. Here, they would combine two distinct styles to produce some rather powerful and flavorful beers. This time around, they appear to have combined about four that I can discern, and with some rather flavorful results. Get some before its gone! Oh, and Happy Birthday Lighthouse! Lighthouse has been doing some impressive things of late. Whether its been their “Big Flavor” series, or their Mountain Goat Maibock and Three Weeds Belgian Wit, or their Switchback IPA and Tasman Session Ale, they’ve been pretty much killing it as of late. 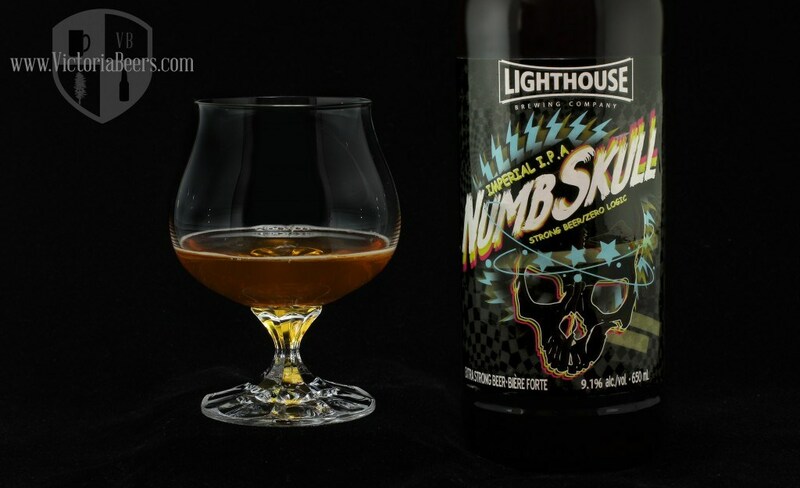 And now they’ve unveiled this latest beer, the Numbskull Imperial IPA, which pretty much accomplishes everything an extra strong, hopped-up IPA should. This includes boasted a rather rich malt profile, a wide array of hops (in heavy concentration), and a strong and powerful alcohol content (9.1% alc/vol). According to the brewery’s own website, the malts of choice include Munich, Pale and Caramel Malts, which allow for a sweet and potent combination. Meanwhile, the hops include the Rakua, Galaxy and Citra varieties, which add up to a citrusy and tropical profile that is both appetizing and quite potent. Especially where the tropical nose and flavor come through. I can honestly attest that it’s like drinking pineapple juice, except with a lovely, malty, alcohol-laced kick! Next up is their anniversary ale, which I intend to enjoy thoroughly! Congratulations, Lighthouse, you’ve been blowing it out of the water of late. At this rate, you might just become my favorite BC brewery! 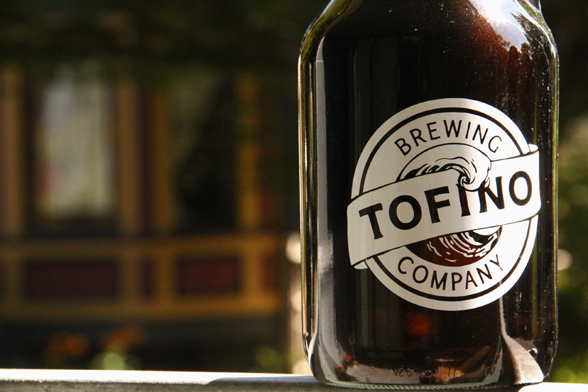 The Tofino Brewery is one of those island operations who’s beers I have few chances to ever sample. While their distributorship appears to be growing, it seems opportunities for me to try their wares are few and far between. The first time I tried anything by them, it was their Tuff Session Ale, which I tried while the wife and I were on vacation there last year. The second time came just a few months ago, when their Hoppin Cretin IPA appeared at my local beer store. 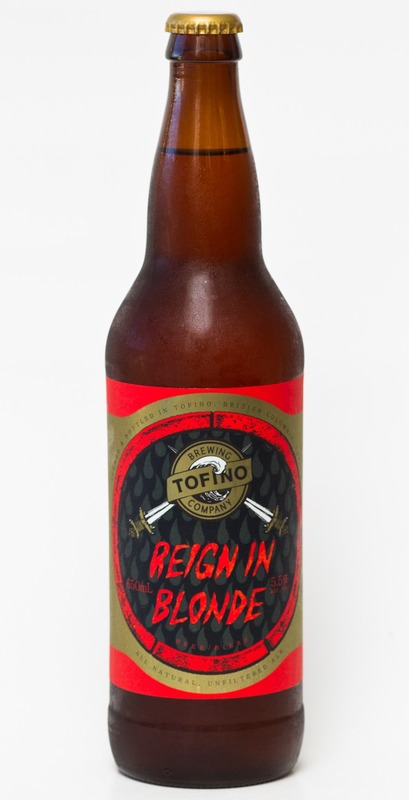 And now, I finally found my way to their Reign In Blonde, the third beer to be introduced in their general lineup (followed by their wheat and porter). And honestly, I had mixed feelings about this one. While it was very refreshing and clean, it was light to the point of being quite watery. And while I do enjoy a lighter beer as much as anyone, I do insist that a craft beer have some range and a degree of subtlety to its flavor. And if its going to be light on hops, the malt profile should have more depth. Otherwise, its virtually indistinguishable from generic brands. As my sampling from this brewery continues, I remain largely impressed, and happy that the west island has its own operation named in honor of its coolest town! Now if only they would brew a dark lager, or some seasonals and limited releases, like a good old fashioned bock or Barley Wine!